Made exclusively for Epiphone by Shadow, the leader in acoustic amplification since 1971, the eSonic and eSonic2 feature studio-quality fidelity, unrivaled dynamics and greatly increased harmonic content resulting in uncompromised acoustic guitar realism. And, with a 5-year Unlimited Warranty, you can rest assured that it will keep working performance after performance. 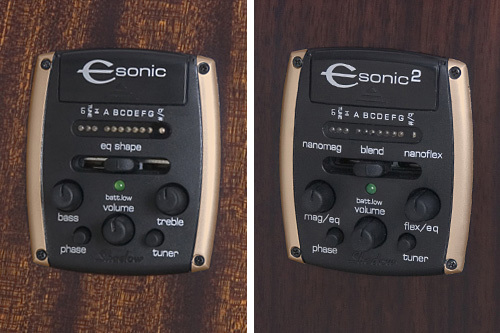 The eSonic is equipped with 3 EQ controls that work together to shape the overall "tone" of your instrument. The controls are: Treble Knob, Bass Knob and Dynamic Slider. Each control has a center "detent" which can be considered a general purpose setting and a good place to start. Treble: This controls the amount of treble or "highs." Rotate clockwise to increase treble up to 9dB and counter clockwise to reduce treble up to -9dB. Bass: This controls the amount of bass or "lows." Rotate clockwise to increase bass up to 9dB and counter clockwise to reduce bass up to 9dB. Dynamics: The dynamics slider reduces or increases the range of the treble and bass controls. Positioning the slider to the left reduces the amount of EQ dynamics while positioning the slider to the right increases the amount of EQ dynamics. The dynamic control also alters the EQ shape allowing you to best tailor the sound of your guitar to fit your style of playing, the volume level and the venue. 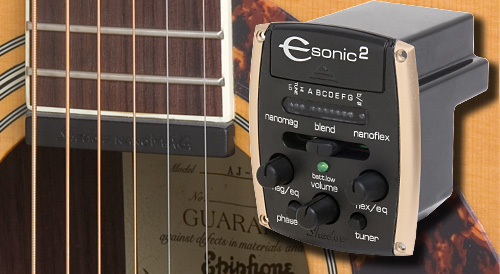 EQ Controls: The eSonic2 is equipped with individual EQ controls for each pickup. They are Mag EQ (Nanomag) and Flex EQ (Nanoflex). Each control has a center "detent" which can be considered a general purpose setting and a good place to start. Each control operates in the same way by increasing Treble up to 9dB when turned clockwise and increasing bass up to 9db when turned counterclockwise. However, these controls are not linear in that other frequencies (in particular mid-ranges) are adjusted as well. This "variable" EQ control allows you to better "shape" the sound. Blend: The blend control is your "mixer" between the Nanoflex and the Nanomag pickups. Use it to control the overall tone of the instrument as well as control the signals coming out of the Stereo outputs. By using it in combination with the EQ controls, you can really tailor the sound of the guitar to fit your playing style, venue and volume level. NanoFlex Pickup: The invention of the Nanoflex pickup technology is the latest and by far the most important step in pickup technology since the first guy wrapped wire around a magnet to produce an electromagnetic field. The term "Nanoflex" refers to its ultra thin (nano-like) profile and its flexibility that allows it to conform to any surface shape. This assures complete guitar-to-pickup-to-saddle contact. Unlike other under-saddle pickups, the Nanoflex design utilizes 7 highly-sensitive and ultra-responsive layers of sensor material to not only sense the vibrations of the strings but the vibrations of the guitar body as well. 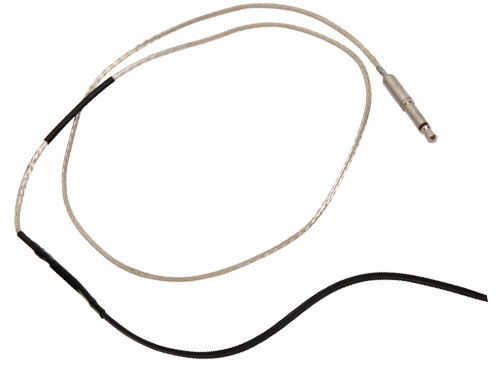 This produces results equivalent to a condenser-microphone mixed with an under-saddle pickup. The Nanoflex is the first pickup to incorporate active amplification directly at the pickup. As a result, the signal does not pass through even a single millimeter of the wire and therefore, the signal quality is uncompromised. Combined with its 100% shielding, the Nanoflex is absolutely and completely noise free. This is different from all other acoustic pickup technology. Nanomag Pickup: Ordinary magnetic pickups have been used successfully to amplify electric guitars for years but when used to amplify acoustic guitars, they fail to deliver desirable acoustic response. That's because magnetic pickups have a very narrow bandwidth with an over-emphasis on mid-range frequencies. The Nanomag, referring to its small size and its composition, is a completely new kind of magnetic pickup that combines 3 Samarium--Cobalt magnets with on-board, active electronics to produce a low--impedance pickup with absolute linear response and an uncharacteristically wide frequency range. One of the single-most important qualities that make an instrument sound the way it does is harmonics. Because ordinary under-saddle or transducer pickups fail to capture the very high and very low harmonic content, the true acoustic character of the instrument is lost. The Nanomag is able to capture all the harmonics - from the lowest to the highest - with incredible accuracy. All with ZERO noise or artificial coloration. This again is different from all other acoustic pickup technology. Nanoflex/Nanomag Combination: While each pickup individually outperforms all others, the combination of the two is extraordinary. The Nanoflex captures string and body vibrations while the Nanomag, mounted at the harmonic-rich end of the fingerboard, captures all the string energy and lush harmonic content. Now, the acoustic guitar has never sounded so real and alive with all its subtle nuances and distinct characteristics.